We are the Academic Council of the University: we are the chairs of the ten campus divisions, as well as the chairs of the systemwide committees. We write to address the protests on many of UC campuses over the Regents’ decision to increase student fees by $2,500 per year. This decision followed budget shortfalls that have entailed significant staff layoffs and cuts to a range of student services. Faculty and staff also are suffering from significant reductions in compensation due to the current year’s salary reductions and furloughs. We share the anguish over the policies adopted in the face of the state’s abrupt 20% disinvestment in higher education. The budget shortfall wounds the institution and community we cherish. We believe these policies are a regrettable but necessary response to the state’s actions. While we are committed to doing everything we can to mitigate their effects on the most vulnerable populations of our students and staff, we recognize that many disagree deeply, and that vigorous and vocal protest is an understandable response. The passionate advocacy of students, staff, and faculty for the University and its public mission has been remarkable. Many of the protest activities were appropriate forms of peaceful advocacy. We are concerned, however, about activities at several campuses that disrupted our educational mission and interfered with the freedom of fellow students, faculty, and staff, to teach, learn, research, and work. We are especially concerned about group protests in which a number of individuals attempted to move past police barricades, physically threaten and throw objects at police, and surround vehicles to trap those within. These activities are unlawful and disrespectful of the rights of others, and they create a serious risk of violence for everyone in the area: police, protestors, and bystanders. A number of injuries, some serious, were sustained last week by both protestors and police officers. We will insist, through all avenues open to us, that uses of force by police will be subject to inquiry and review, as well as the policies that govern crowd control. While we expect campus police professionals to be committed to accommodating peaceful protest, we realize that there may be failures of policy or individual action. We are committed to ensuring that the University remains a place where it is safe to teach and learn – and engage in peaceful protest. At the same time, we wish to remind everyone of the limits of protest, and of our obligation to be civil, to show respect for different points of view, and to take personal responsibility for our own and each other’s safety. Occupation of university buildings, for example, directly interferes with the rights of other members of the community. The problems that confront our University are daunting, and finding solutions to them will require the collective best efforts of our students, faculty, staff, and members of the community. Tempers will worsen and patience will shorten as these policies take hold, but we must channel our energies outwards, towards advocating for restoring funding to the University of California so that it can fulfill its mission of providing democratic access to the great research universities of our state. "The use of genetic data to delineate management units for California fishes"
Dinner and social hour begin at 5:30 pm Delicious food!! Thirst quenching beers and healthy sodas!! Just got this email from the National Science Foundation saying that NSF is looking for more grants relating to responses of organisms/ecosystems to climate change. The Divisions of Integrative Organismal Systems (IOS) and Molecular and Cellular Biosciences (MCB) in the Directorate for Biological Sciences at NSF encourage submission of proposals that address the biochemical, molecular, cellular, genetic and/or organismal underpinnings of adaptation and biological feedbacks to climate change. Interdisciplinary and systems level approaches to these problems are encouraged. A cross-divisional working group has been established to ensure that exciting proposals in this area receive adequate and appropriate attention. Life on earth contributes actively to the forces involved in troposphere climate and chemistry. Not only are organisms key participants in climate and chemistry forcing functions, they are also highly sensitive to changes in many climatic and chemical properties of the troposphere. Research is needed to understand the limits of biological adjustments to such changes, and the feedbacks on climate and chemistry that will result. The Foundation has a rapidly growing commitment to research directed towards understanding the interplay between living organisms and the earth’s climate and surface chemistry. In the Directorate for Biological Sciences, this was emphasized last year by the establishment of a special Life in Transition activity, as announced in an open letter to the research community, accessible at: http://www.nsf.gov/pubs/2008/nsf08078/nsf08078.jsp?org=NSF. Please consider submitting proposals of this kind to IOS and MCB using the ‘LiT:’ title preface described in the Life in Transition ‘Dear Colleague’ letter referenced above. A project summary and introduction that place the proposed research in the context of global climate change will be most helpful in determining appropriate sources of funding within NSF. If you seek further information, queries sent to this return email address will be directed appropriately to insure a prompt reply. Last week I asked for people to post suggestions for bad new omics words as candidates for my "Worst new omics word award". And there were some great ones posted there by MAT kinase (physiomics, orfeomics), Mr. Gunn (degradomics, though he noticed it was already suggested), anonymous (incidentalome), Karl Broman (human connectome), Paul (splicome), blJOg (Systemomics), Farhat Habib (resourceome), Rosie Redfield (sewa-genomics), Marmaduke (Microbial paleomics), and many others. But by far and away, the worst of the worst, the most negative of all new omics words I have seen in a while, is the negatome suggested by multiple people. Yes, indeed, a group ( Pawel Smialowski, Philipp Pagel, Philip Wong, Barbara Brauner, Irmtraud Dunger, Gisela Fobo, Goar Frishman, Corinna Montrone, Thomas Rattei, Dmitrij Frishman and Andreas Ruepp ) has written about, and even created a database for the negatome (for an excellent description about what the negatome is about, see The ‘negatome’ – a database of negative information… « mental indigestion (from Dr. Jim). The concept of the negatome is good - it- "is a collection of protein and domain pairs that are unlikely to be engaged in direct physical interactions". It is meant in many ways as a database for testing various interaction measuring methods. And it could end up being quite useful. See Dr. Jim for more on its uses at the link in the previous paragraph. But the name. Oh the name. It hurts to see. It hurts to say. ... as suggested by GenomeWeb "Just watch out for Jonathan Eisen's Worst New Omics Award." ...and contrary to the suggestion by Ed Winstead on twitter who misinterpreted my twitter post about Iddo's post when he said "Liked "The ‘negatome’ – a database of negative information" http://bit.ly/5ht98d even got the nod from @phylogenomics"
... Negatome the word is a winner of my coveted "Worst New Omics Word Award". 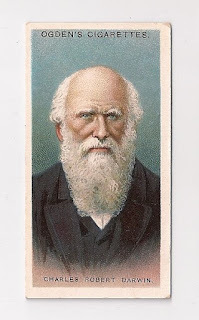 In honor of Charlie D. I am posting one of my favorite Darwin items. I got this from Ebay years ago. It is a Darwin card - about 3 x 5 cm. 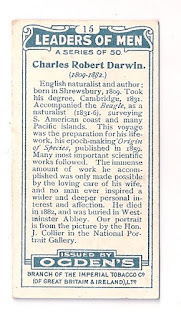 From Ogden's Cigarettes, much like baseball cards. 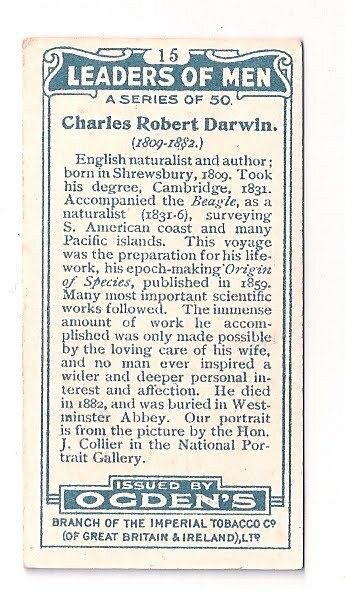 Also see my previous "Favorite Darwin thing" - a post card from 1900 or so. OK - been on the pump now for about 1.5 weeks. Been OK. A huge learning curve here after 25 years of taking insulin shots. It feels a bit like I am going back to school. So much to learn. So much to unlearn. Anyway. I am getting to know a few people on pumps too and they are an invaluable resource. What I find most amazing so far is how my kids, 4.5 and 2.5 years old, take this completely in stride. My 4.5 year old daughter now asks which pocket I am carrying the pump in so she can sit on the other leg. And she has asked if it is nice to not be taking shots anymore. Completely casual. Completely normal. So far - my biggest challenges have been figuring out how to carry the pump and inserting the infusion sets. Getting the hang of the infusion sets (I am using a Medtronic pump currently with the Silhouette infusion system). Still no clue about how to carry the pump in diverse situations, like riding my bike in the rain ... but I guess I will learn. Kudos to mBio the recently announced new open access journal from ASM. I posted a little bit about it a few days ago. There was some back and forth in the comments w/ people involved in the journal and, impressively, they have already modified some sections of the web site to clarify some of the things I and others felt were unclear. A pretty rare thing in the world of journals as far as I know, to make changes quickly. Normally there would be some sort of deliberative, painfully slow, and annoyingly conservative process in response to comments/feedback. Good job Barbara Goldman and ASM. And happy to have ASM moving a bit more towards an Open Access future. For crying out loud, I am still getting crappy spammy mail from various "Bentham Open" journals. The most annoying part to me of Bentham Open is that they try to make it seem that anything published in an Open Access journal is better than anything published in a non Open Access journal. While I personally believe publishing in an OA manner is great, lying about the benefits of OA is not a good thing. Your article will obtain more citations. Your article will be peer-reviewed and published very fast. Your article can be read by potentially millions of readers, which is incomparable to publishing in a traditional subscription journal. All published open access articles will receive massive international exposure and as is usually the case for open access publications, articles will also receive high citations. Yes, that is right, the crappiest, most boring, most idiotic article in an OA journal will receive "massive international exposure" and "high citations." Spam journals or open journals? Jeffrey Beall, summed up by Peter Suber. Blogger in need of material while taking a little break for medical reasons needs help. Seeking bad new "omics" words to give "Worst New Omics Word Award" to. Junkome from PZ Myers already under consideration. Please post suggestions here. Nice little story in Nature News about the need to sequence "neglected" microbes. "The broad brush strokes of microbial diversity are not adequately represented in that first thousand," says Stephen Giovannoni, a microbiologist at Oregon State University in Corvallis. "It's absolutely important that we sequence more." "There's no doubt to us that filling in the branches of the tree is going to be useful to lots of scientific studies that use genomic data," says Eisen. "There have been four billion years of evolution and we can really benefit from having some of that information in our databases." All these new genomes should improve researchers' understanding of the evolution, physiology and metabolic capacity of microbes, says Eisen. They will also help match DNA sequences to their proper species from large-scale, high-throughput metagenomic studies from environmental samples, and ultimately contribute in the fields of synthetic biology and genetic engineering. OK - now this is really going viral. The slingjaw wrasse video from Peter Wainwright's lab at UC Davis (which I wrote about here) has now made it to ESPN. ASM’s first broad-scope, online-only, open access journal, mBio™ will begin accepting submissions in January 2010 in preparation for launch in May 2010. mBio™ will offer rapid review and publication of the best research in microbiology and allied fields. The scope of mBio™ will reflect the enormity of the microbial world, highly interconnected biosphere where microbes interact with living and non-living matter to produce outcomes that range from mutualism to parasitism, energy acquisition and conversion, climate change, geologic change, food and drug production, and behavioral change. “We will encourage authors to explain how their findings fit into the larger picture,” says Editor in Chief Arturo Casadevall. Find out more at http://mbio.asm.org. "Researchers report in the journal Analytical Chemistry that a new "sniff test" can measure degradation of old books and historical documents." Through similarities with metabolomics,(15) we propose to define a new field of material degradomics (and related terms, Table 1). I literally dread what is in table 1. For creating a new omics term that seems thoroughly unnecessary and distracting, I am giving Matija Strli and colleagues one of my coveted "Worst New Omics Word Awards." Hat tip to PaulBo who posted a comment about this on my "Fermentome" award post. Well, Day 2 on the pump was better than Day 1. The night went well -- was a little weird to have a thing attached to me all night but not so bad - slept in some nice big Livestrong sweatpants with big pockets where I put the pump. Earl AM went fine - had some issues with the pump in mid day - not sure what exactly was going on but still fine tuning the dosing and all the parameters with trying to make the pump mimic a pancreas. Anyway - enough about me. Most important thing to post today is that tomorrow is World Diabetes Day. Lots of events and activities and other things going on in the real and cyber world. OK I am now a bit blown away by twitter. 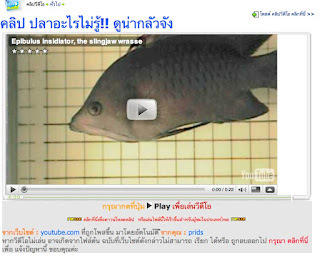 "Peter Wainwright showed this crazy slingjaw wrasse video in our class at#UCDavis yesterday:http://tinyurl.com/ybqv429"
And then a few others retweeted/commented on this. Then Carl Zimmer blogged about it on "The Loom" in a post "The last thing the mosquitofish saw". And that is really when the fish hit that fan. 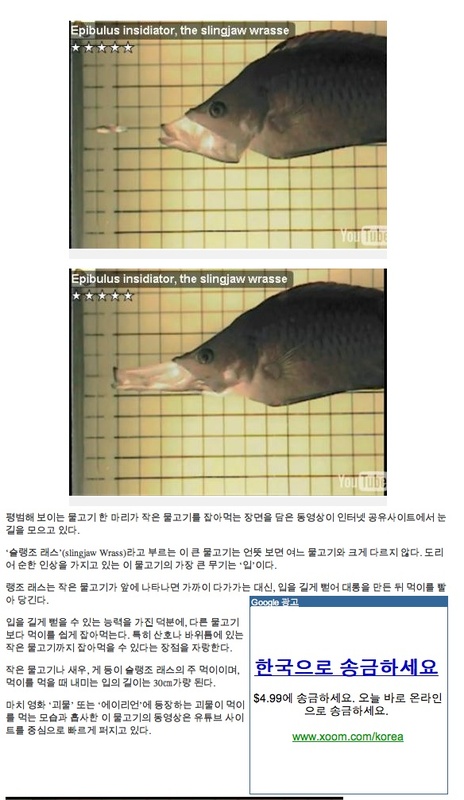 "Almost 6,000 people have watched the YouTube footage of Epibulus insidiator, a strange predator found in tropical waters in the Pacific and Indian Oceans." Little did he know what would happen next. 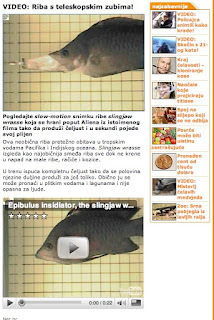 It seems to have then gotten picked up by all sorts of web news sites around the world and KABOOM, like the fishes jaw, this video went crazy. 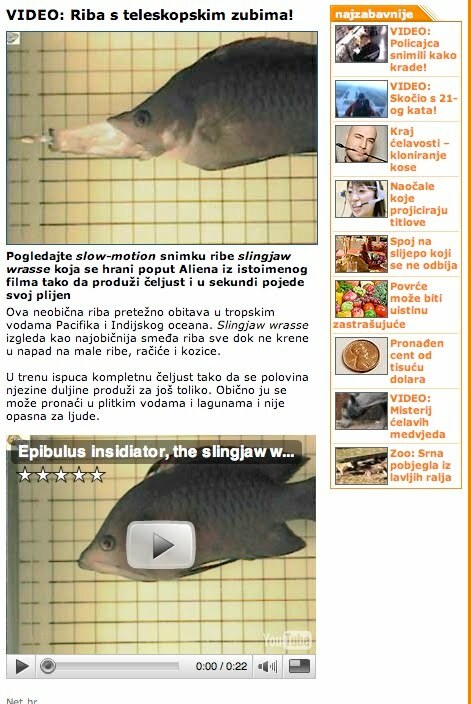 Dept of WTF: Wierd fish. Well, after a HORRENDOUS experience with the Insulin Pump last summer, I am trying it again. Last summer, I spent 2.5 weeks on the pump. Week 1 was freaky - getting used to the whole concept after 25 years on insulin. Week 2 was pretty nice - getting used to the whole thing. Week 3 was the worst - got a very bad infection at the pump insertion site. After a few days went off the pump and then spent 1.5 months dealing with something akin to MRSA. Never got the organism typed (which was really really dumb in retrospect) but when the third antibiotic I went on started to work it seemed like MRSA. Anyway - more on the disaster later. Today is for new beginnings. Starting on the Insulin Pump again. Got trained by the Medtronic specialist, which went much better this time than last time. And was up and running in ~ 2 hours. And then I went off with the pump connected, a cyborg again for the first time in over a year. I went to work for a bit for my lab meeting (a student was presenting and I already delayed her presentation last week so could not ditch her again this week). And after talking to people a bit after lab meeting, I went home. This time around, with a year to think about things, I feel much better being on the pump Of course I could still get an infection but hopefully that will not happen and things will go better this time. 1000 Complete Bacterial and Archaeal Genomes in Genbank. Big MileStone. Good day for a microbial genome party. This whole thing is amazing to me. I moved to TIGR in 1998 in order to get in early on the "genome sequencing revolution" as we called it then. We were amazed when the 10th genome came out. We were then thrilled when TIGR sequenced its 20th genome. And now, there are 1000. Amazing. And as Nikos Kyrpides just told me (he is sitting next to me right now) - actually if you go to GOLD (Genomes Online) (Nikos runs this DB) you can see there are actually a few more than 1K there. Even more amazing. Come and hear about this emerging synthesis of systematics and ecology that promises to transform the way we do both! 7:00 - talks followed by discussion, in same room. For a map of this region of the UCD campus, use the link below. R. Knight #NASMH "much as we love rRNA at Boulder we accept that we have to look at other parts of the genome"
# Rob Knight from CU-Boulder talking at #NASMH on 16s rRNA "enlightenment"